Read the car seat instruction manual and the portion of your vehicle's owner's manual on car seat installation. Every car seat needs to be installed using either the LATCH system or the seat belt to secure it in place. If you choose to use a seat belt to install your car seat, pay close attention to how to lock your seat belt in the vehicle owner's manual. Because every car seat and vehicle is different, it's important to follow all instructions carefully. If you have questions, trained Child Passenger Safety Technicians can help you. Look for a Safe Kids Coalition near you. Buckle the harness and the chest clip and tighten. The harness is snug enough when extra material cannot be pinched at the shoulder. 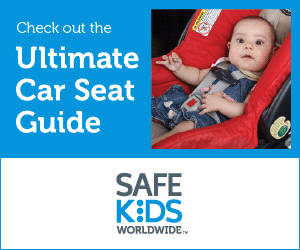 You can also visit The Ultimate Car Seat Guide website at SAFE KIDS Worldwide for selection, usage and installation information and videos personalized to your child.